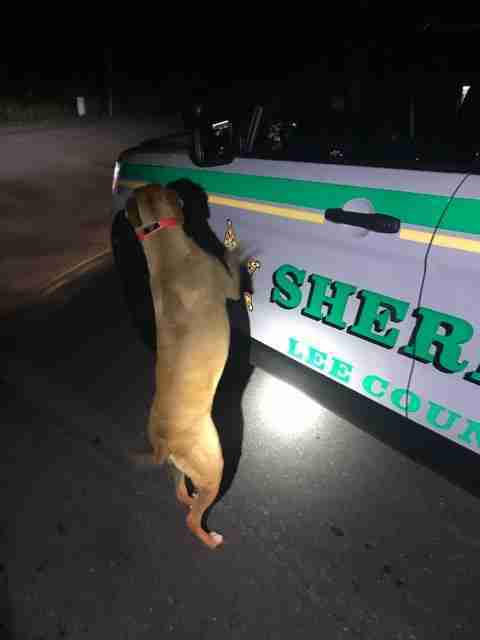 Deputy Soto and Sergeant Rose, of the Lee County Sheriff's Office in Florida, had just finished responding to a call and were heading back to their police car when they noticed something standing against one of the doors. As they got closer, they realized it was a dog — who appeared to be a little lost. The dog was immediately happy to see the officers, and it almost seemed as if he had been waiting for them to help him. They noticed he was wearing a collar, and assumed he had somehow gotten separated from his family and was hoping they could help him find his way back. Hank was so excited to see the officers, and gratefully accepted some food and a ride. Luckily, there was an address on Hank’s collar, and so the officers were able to drive him home and reunite him with his family before he had barely even been gone at all. “The owner was not aware that Hank had gotten out,” Levine said.